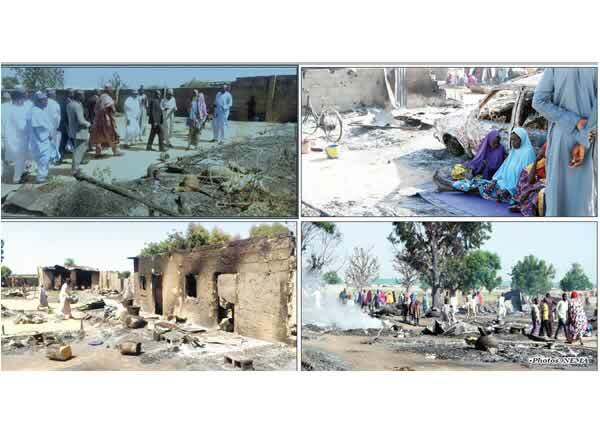 The District Head of Duhu and surrounding communities in Adamawa State, Mohammed Sanusi, said Boko Haram fighters stormed two villages in Michika and Madagali on the border between Adamawa and Borno states on Monday night, burning houses and looting barns and food stores. Some of the villagers who spoke to our correspondents from their hideouts said they slept on the mountains, adding that vulnerable villagers like the elderly, children and the sick were threatened with guns and other weapons by the insurgents. It is not ascertained yet if there were casualties. According to Sanusi, the insurgents returned to the villages on what he described as “revenge mission” after they failed to make the best of their last attack on Michika and Madagali towns seven days earlier as the Nigerian Army repelled the attack. Monday’s assault, he said, was the third deadly mission of the insurgents in the state in the past one month.